The Allies' M10 Tank Destroyer and the Germans' Sturmgesch tz (StuG) lll were the unsung workhorses of the northwest European battlefields of 1944 45. While their mission was not principally fighting one another, their widespread use ensured their frequent encounters, from the Normandy Bocage, to the rubble-strewn streets of Aachen. 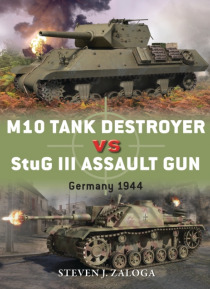 The StuG lll was the quintessential assault gun, a low-slung, hea… vily armoured, turret-less vehicle intended to provide direct fire support for infantry formations, whilst the M10 3in Gun Motor Carriage was originally developed as a tank destroyer. However, by 1944 the 3in gun proved ineffectual against the most thickly armored German tanks, and was consequently relegated to infantry support too. Widely deployed in roles their designers had not envisaged, these two armoured fighting vehicles clashed repeatedly during the 11-month campaign, which saw the Allies advance from Normandy to the heart of the Reich. Fully illustrated with specially commissioned artwork, this is the story of their confrontation at the height of World War ll.